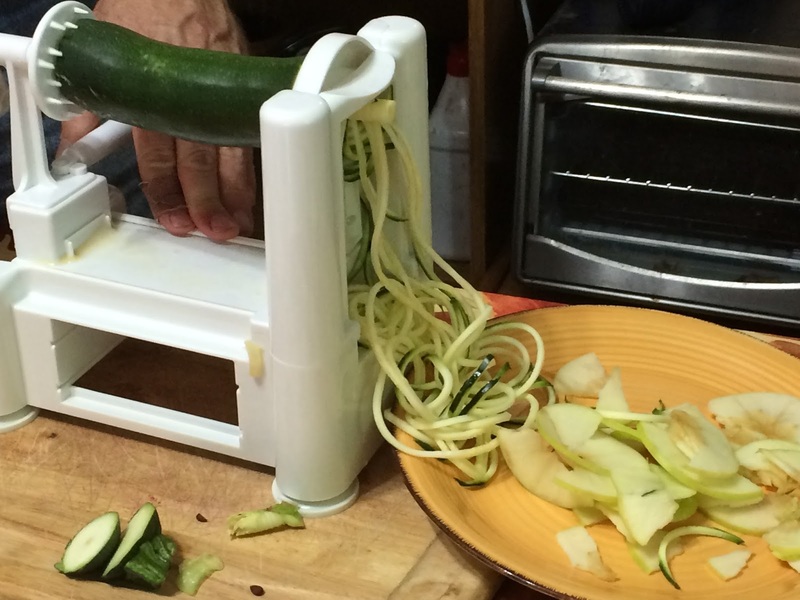 I've been wanting a vegetable "spiralizer" for a long time now, especially when I would see photos of zucchini and squash "spaghetti" and now that I'm working on the low carb thing I figured this would be the perfect thing to replace pasta. 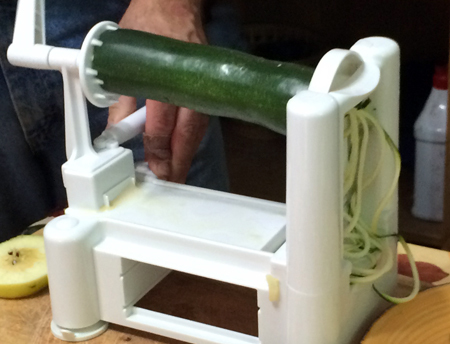 I did a lot of research before finally settling on a "Paderno" vegetable slicer. 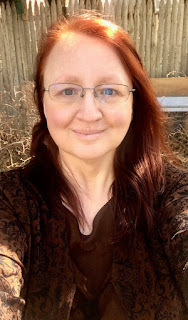 I like to read reviews and I want to know what to expect when I invest my time and/or money in something. This one had had great reviews across the board and was a decent price so I went with it. I got mine at Amazon which is where I get most of my stuff. It came in the mail yesterday and we tried it out this afternoon. 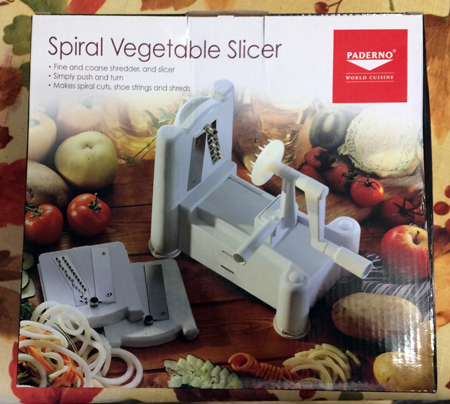 This vegetable slicer comes with 3 cutting blades; a "shredder" blade with the smallest holes to make spaghetti -like cuts, a "chipper" blade with the larger holes to make medium cuts that resemble curly fries and the straight blade that makes ribbon-like cuts. You can't see the straight blade one in these photos because it was already in the machine (it comes that way) and I didn't think to take it out. 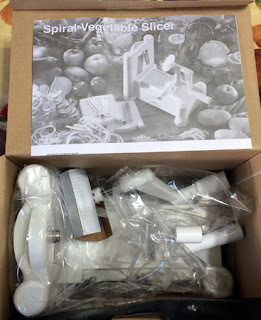 Also included in the box are the crank handle and the pronged wheel, and there is a space on the main slicer where you can store two of the cutting blades. 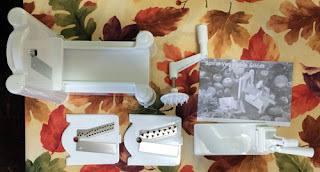 The main slicer also has 4 suction feet on the bottom of it, but we tried it on the kitchen table and a cutting board and couldn't get the suction feet to stick no matter how much we pressed down according to instructions. 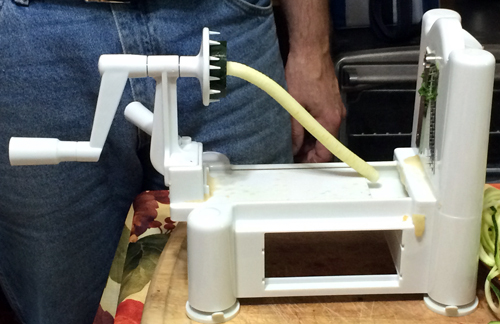 It was only after we had washed the slicer that we realized that maybe we should have wet the feet down first? I'll give that a try next time! 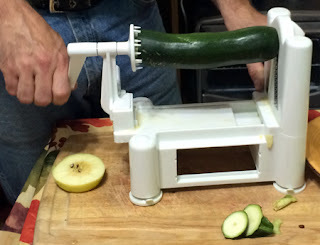 Since I knew I was going to be writing this review tonight I wanted to try out each blade so I went with a zucchini for the smaller blade, a summer squash for the medium blade and an apple for the straight blade. 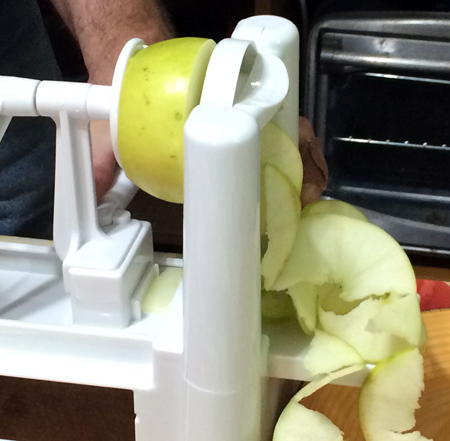 The slicer was very easy to put together and the directions were simple and clear. The crank handle with the wheel prongs attached to its spot on the slicer very easily and the blade plates just slide in and out of their positions. 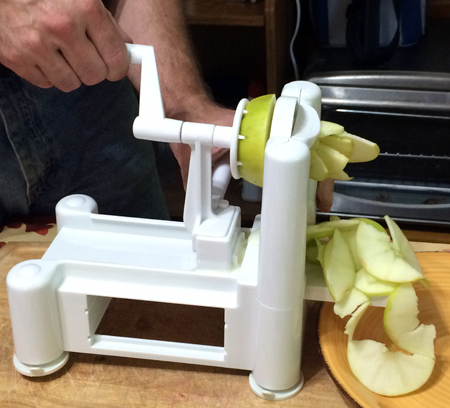 Since the straight blade was already in the slicer we decided to start with that one. It did take us a minute to figure out that we had to cut at least one end of the apple off before attaching it to the slicer. It doesn't say to do that in the written directions but Charles found it on the box in one if the images. 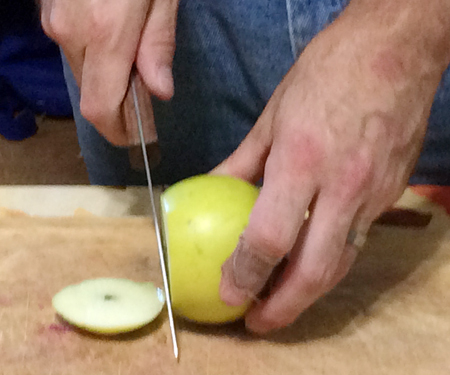 Maybe you don't have to cut off an edge with everything but we did to be on the safe side. Once the end was cut (we only cut one end of the apple), it was attached to the corer in the blade plate and then pushed into place with the prongs from the other end. 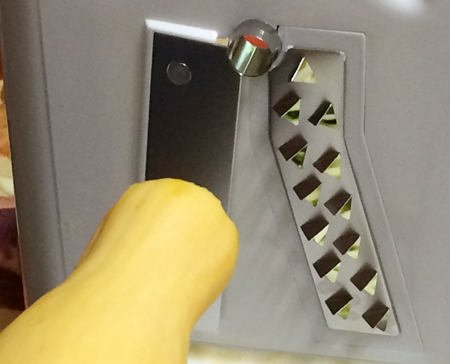 Then all we had to turn the handle while keeping a steady pressure on the sliding plate and magic happened! 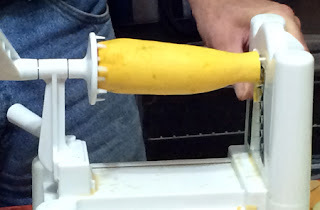 You'll see as you continue to get through the fruit or veggies that the core remains in the machine while everything else comes down. You can't see the core here because it broke off and as you may be able to see in the third photos, some of the apple pieces got stuck but it only took a few seconds to unstick them. After the apple we moved on to the small hole blade to make "spaghetti" out of zucchini. You can see in this photo what the core looks like when it doesn't break off. 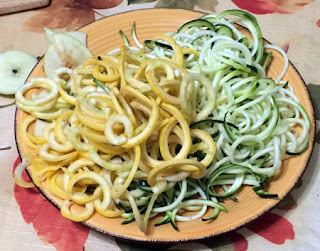 Most of the zucchini came out in very long thin strands but a few of the pieces at the beginning broke off into moon-like crescents. After we were done with the zucchini we moved on to the blade with the large holes to use on the summer squash. We cut off both ends of the summer squash as well and it came out like curly fries which was pretty cool. The core of the summer squash was just like the zucchini core. Only the apple core broke off. 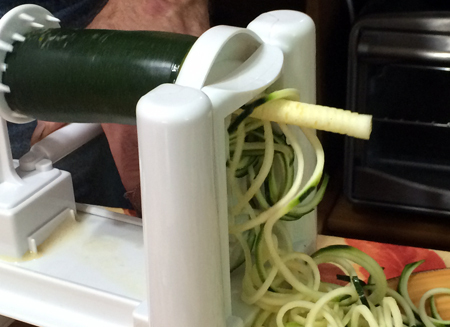 Once we were done with everything we ended up with a plate full of awesome looking "pasta." We'll be cooking it tomorrow and I'll update on how that goes. 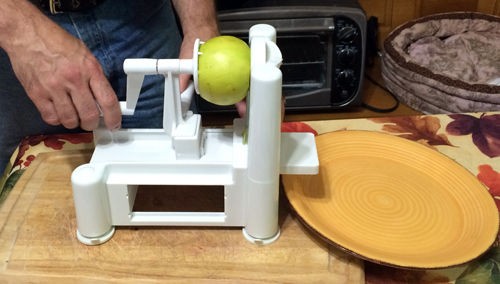 Taking the slicer apart only took about a minute. We washed each blade separately with one of those scrubby brushes and washed the machine itself with a regular sponge. It cleaned up very easy and quickly. The directions say that it's dishwasher safe but we don't have a dishwasher so that part didn't matter to me. I think the entire process, including putting it together, until it ended up in the dryer rack took, maybe, 15 minutes, and we ended up with a huge plate of food. The instructions page also has info on how to make c-shaped cuts and ribbon cuts so we'll be playing with that in the future and we will absolutely be using this machine with a lot more fruits and vegetables. 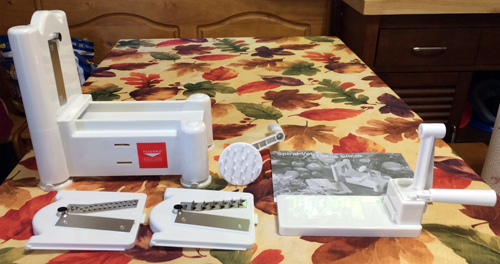 I can't wait to try it out on a sweet potato. This slicer is very easy to use, it's simple to put together and take apart and it cleans up quickly and well. So far I'm loving it but I won't know how it holds up to frequent use until that actually happens so I'll update this review in a few weeks or months! 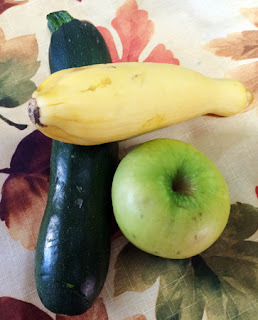 Let me know if you guys have any questions and feel free to send veggies recipes my way! 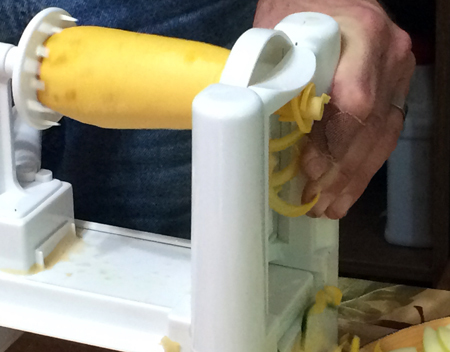 So did you try it w/the sweet potato? That's such a ruff veggie-just wondering how that went? 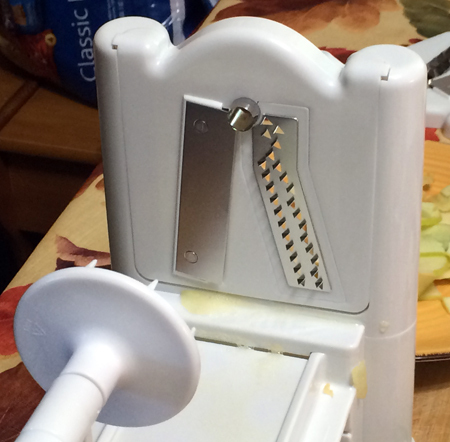 Hi, we never did try the sweet potato but I definitely want to start using this slicer again!